Sandwiches are perfectly fine. I have nothing against them, and do partake now and then. But give me a nice bowl of soup or pasta for lunch any day. After a few days of less-than-healthy eating (fast food, way too much ice cream), my body was rebelling. It doesn’t help that, although I’m on my feet for longer stretches now, I’m still not getting much exercise. If it were summer, I’d build a salad. This time of year, soba with greens is the perfect antidote to this pudgy lethargy. Our fridge is rarely without a stash of fresh spinach. The guys love it, and I eat it several times a week. If you’re eating the same ridiculously healthy food all the time, is it still a rut? Anyway, it was time to try a different green. Kale holds its texture better than spinach does when it’s cooked. The sturdy leaves with their frilly ruffles have such a lovely deep, piney green color. I think kale is reminiscent of seaweed, and I don’t mean that in a bad way; it’s pleasantly chewy when cooked, and has a faintly briny taste that’s quite different from spinach. You’ve heard me extoll the virtues of soba noodles here and here. They’re perfect for lunch or a quick dinner in no small part because they cook in about 4 minutes. Their earthy flavor stands up to the kale, and the nuttiness is enhanced with a handful of toasted walnuts. Add the nuts after you plate the pasta, since if you cook them in the sauce you’ll lose the crunch. Cook your sauce to completion before you put the soba in the boiling water. The noodles cook so fast that you want everything else to be ready. I used roughly half water, half stock but you can use all stock (vegetable or chicken) if you prefer. Add more liquid if you like a soupier dish, and finish with a drizzle of extra-virgin olive oil if you’re feeling indulgent. A lunch that’s fast, delicious, and virtuous all at the same time. Can’t get much better than that. Put a medium saucepan full of water on high heat to bring to a boil. While that warms up, toast the walnuts over medium-high heat in a large dry skillet, shaking the pan frequently, until the nuts are fragrant and lightly toasted, about 4 minutes. Set the walnuts aside and return the pan to the heat. Add the kale and the 3/4 cup water, along with a few pinches of salt and several grinds of pepper. Stir well to combine and cook for about 5 minutes to wilt the kale. Add 1/2 cup stock and continue cooking; check the kale after another 5 minutes. The goal is for the leaves to be tender but still green. Stir in the olives and reduce the heat to medium-low. Add at least a tablespoon of salt to the now-boiling water in the saucepan, then stir in the soba. Cook for about 3-4 minutes until just barely short of perfect. If you stir the soba often with a fork, it keeps the noodles from sticking together. 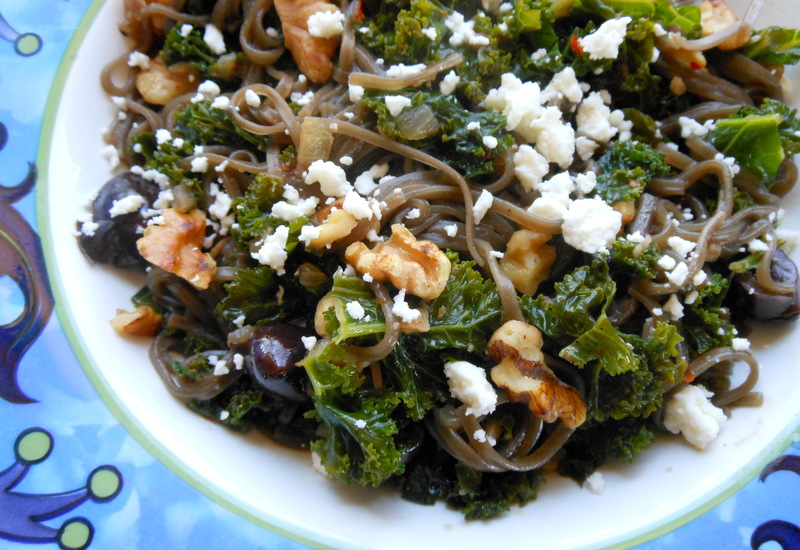 Scoop the soba into the kale mixture in the skillet, allowing a few tablespoons of pasta water to join the kale. Raise the heat to medium-high again, and add a splash of stock if it looks dry. You want extra liquid to pool under the noodles, but you’re not making soup here. Cook for 1 minute, stirring constantly, until most of the liquid is absorbed into the noodles and the soba is completely cooked through. Pour into two serving bowls, top with the walnuts, and sprinkle with feta. Lunch is ready! This entry was posted in main courses, pasta, rice, and grains, veggies and tagged greens, healthy, kale, low-fat, lunch, noodles, olives, pasta, soba, vegetarian. Bookmark the permalink.